Val (as in Val!) is the thirty-something publisher of Val Magazine. She is egotistical, vain and continually tries to pass herself off as barely out of her teen years (even though her real age is obvious). The character is shown in the episode, "The Lost Girls". She claims partway into the episode that in school, she was "a bit like Daria. I wrote all the time. I was smart, I was cool..."
What we know about her daily life is that she spends a lot of time trying to further her own image & fame - usually while pretending not to, such as her PR man 'accidentally' leaking that she'd be at Lawndale High - and tries to move in the same social circles as young celebrities. She tends to namedrop the first names of celebrities she's met. In conversation, she alternates between seemingly-clueness attempts to sound young & cool and cynical media manipulator. A brief glimpse behind the mask was shown when she discovered her (younger) boyfriend Drew, a celebrity, was dumping her for a starlet that he'd got pregnant: she was left distraught, had to mutter the calming mantra "I am Val as in Val" (something she appears to have done before), and made angry & upset threats to destroy his career. Val realises the other girl is Daria. She has a friend called "Nonie". 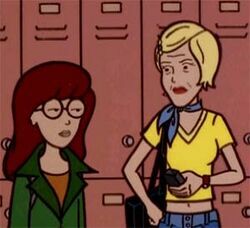 When Daria (thanks to Timothy O'Neill) won a "Spend The Day With Val" contest, Val came down to Lawndale and managed to go almost a whole day acting like Daria was her BFF and they were bonding and Daria's lack of popularity wasn't a disappointment to her. Little glimpses could be shown of the opposite, such as the brief look on Val's face when she first met Daria, a slight look of contempt when she first saw Jane walk past, her 'joke' of "finally some popular people" when the Fashion Club arrived, and even forgetting where she was for a second and looking at Daria with bemusement & giving an affronted "who are you?". Val was left briefly rattled when Sandi Griffin suggested she was making a fashion faux pas and fled to change. Eventually, Daria got fed up and directly criticised Val's status as a self-proclaimed role model and her attempt to pretend she was still a teenager (Daria mentioning her real age seemed to bother her more). Val, in anger, came close to calling her "a brain" and went on to write an article trashing a disturbing "anti-teen" called "D". 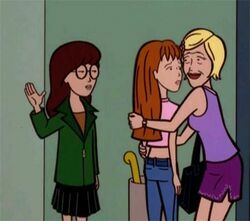 Val, forgetting to pretend she likes Daria for a second. Val is a parody of Jane Pratt of Jane Magazine. (Guestward Ho! : "But her name has four letters, so it's so totally not her!") Pratt seems to be a good sport about it, in 2010 being asked to contribute questions to a Tracy Grandstaff interview and asking "would you parody someone now in order to make a social statement? I’m curious, as I used to make fun of people like New Kids On The Block back in the Sassy days". Daria 2: The Curse of the Misery Chick: Parody of teen horror movies, with Val taking a role ala the reporter Gale in Scream. Val was the guest timekeeper for the main event of the LFC's "Is It 'Mania Yet?"